Provide your clients with three valuable event services, which include: hand sanitizer ad station, mobile charger media player and water cooler, all-in-one service bundle. Your brand messaging along with three guest services are tied together with a bold floor-advertising mat. 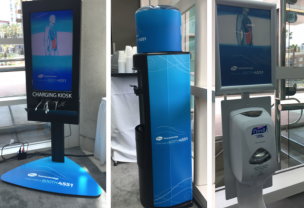 Service Features Include - Branded hand sanitizer kiosk, branded Monitor Max Mobile Charger, branded water cooler, and branded mat. Premier Placement - Your message will be seen and remembered, with lobby placement.